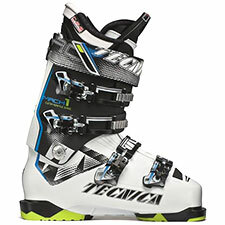 New for the upcoming 2014-2015 season is Tecnica's Mach1, which employs what Tecnica calls a paradigm shift in ski boot construction: designing "from the inside out." By this, Tecnica means they've built the liner to fit the foot, and then built the shell to fit the liner, instead of the reverse. Don't other boot makers already do this? Yes, to some extent—obviously they're not oblivious to the shape of the human foot. However, I will categorically say I've never before seen a shell that has been shaped with this much attention to anatomically-correct detail. That includes an asymmetrical toe-box (to match the shape of your toes), medial side contouring, navicular bone contouring, and a deeper grove in the heel to create space for the Achilles tendon. The Mach1's cuff has been updated as well—Tecnica says it too has been designed to better follow the shape of the lower leg and shin. All this shell-shaping is notable, but the bigger story may be the Mach1's new 'adaptive' liner, which also is shaped to the foot, and which uses microcell foam that better adjusts to individual foot differences. I noticed the new liner as soon as I put my foot in the boot—it has a silky-smooth, slightly-squishy feel—and I liked it. Together, the new liner and shell give us a performance Alpine boot that likely offers one of the very best out-of-the-box fits in its class. It is a comfortable fit, no doubt. And, if the medium-volume Mach1 doesn't strike your fancy out of the box, Tecnica has built the boot to be easily customizable, with a number of features (including thermo foam) to make your bootfitter's job easier. How about on the snow? Those of you who are familiar with Tecnica's distinctive upright and direct feel will recognize the boot's pedigree right away. I always find myself thinking of a charging bull when I ski a Tecnica boot (I used to race on the old TNT's), and that's an apt image of the boot's character. In contrast to my Lange RS's, the Mach1 is definitely not as nuanced on the hill. The Mach1 is abundantly powerful, and very much at the high end of the Freeride/All Mountain performance category. The boot has a shock-absorbing heel, and yet it gives good feedback of the snow—another Tecnica hallmark. Soles are swappable for Tech binding compatibility, and there's a flex control switch on the rear. The boots measure a hefty 10lbs, 3.5 ounces per pair. Tecnica sent me a 120, which felt stiff enough, and which comes in a handsome white. In size 26.5, the shell length is a generous 310mm; many skiers will want to down-size for a close fit. The Mach1 will be available in four flex profiles, from 130 to 90, with the stiffest three models getting the new 'adaptive' liner. Overall, the Mach1's innovations are clearly aimed at improving fit rather than dramatically altering performance. The boot offers an interesting blend of out-of-the-box comfort plus bootfitter-friendly features, reducing the likelihood you'll need extensive fitting work while also expanding the bootfitter's options, should custom fitting prove necessary.